Elise Engh Studios: Hat Season is Here! I made all of these for my Etsy Shop to get stocked up for the season. You can check them out in my Crochet Accessories Section. 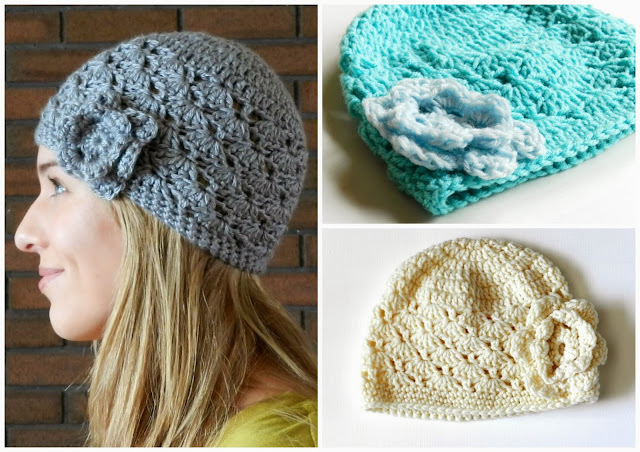 And..... if you feel so inclined...... you can make one yourself with my newly revised Free Shell Hat Pattern. I have to thank my crocheting friend Jodi for her help in making this pattern better than it was before. I couldn't have done it without her. Well, I've had a look around your beautifully creative blog and you are a very talented, pretty young lady! Kudos to you for all your design savvy and love these darling hats! Thanks for visiting Poppy View and for your sweet comment!